ioBridge provides two core technology components that make it easy and cost-effective to internet-enable almost anything. ioBridge's technology overcomes the inherent installation, operation, and scalability limitations of embedded web servers by offering a cloud-service for embedded devices. Our solution consists of low-cost embedded hardware and firmware that is tightly integrated with highly scalable and robust cloud services and dashboards. We created realtime.io to be an instant communications link between devices and applications. Our platform is leading the architecture for the Internet of Things by leveraging real-time web services and cloud technologies. realtime.io is designed from the ground up and solving a lot of issues with building wireless sensor networks, M2M, and remote control and monitoring applications. 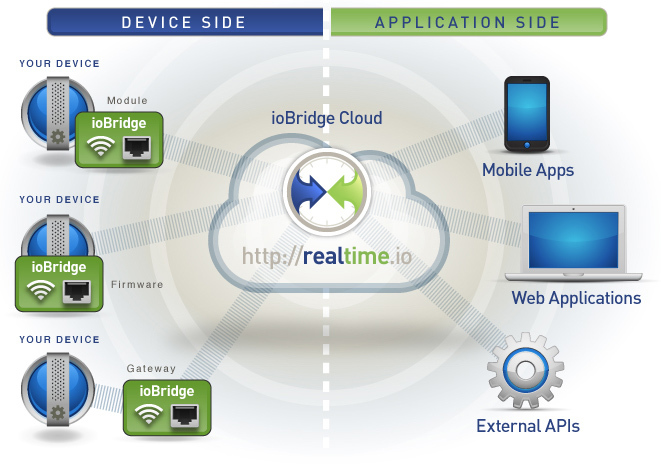 realtime.io enables the suite of technologies that ioBridge licenses to companies looks to build next generation products and services. » Your Device + ioBridge Module. Add our embedded module to your device that makes it incredibly easy to interface with the ioBridge Cloud and leverage real-time web services. Our module includes encryption, network management, and a straightforward hardware level API simplifying development efforts. » Your Device + ioBridge Firmware. Many of our customers have existing hardware platforms and network connectivity. By installing ioBridge Firmware to your device, you get instant communications with ioBridge and our core services. We also support Android, Embedded Linux, and many other embedded platforms. » Your Device(s) + ioBridge Gateway. When you are trying to support new features or many devices on a local network, all you need to do is add an ioBridge Powered Gateway to access web services. This is great configuration for large wireless sensor networks, automation systems, or legacy control systems. » Ease of installation and operation. Our embedded devices are designed to be easy to install and manage. They bypass firewalls and communicate directly to an ioBridge server on the web. No port-forwarding or dynamic DNS configuration is required making installation easy for the everyday user. » Low cost. Rather than using linux running on expensive CPUs, ioBridge's embedded hardware and firmware uses low-cost microcontrollers and can leverage existing designs. » Easy to create new applications. ioBridge provides a free web-interface and user configurable dashboard. Customers can create new a dashboard to monitor and control almost anything without writing any software. » Highly scalable and expandable. ioBridge's cloud server technology is able to support 100,000 to 1,000,000 devices per server in low-traffic situations common to many internet-enabled devices. ioBridge provides a web API that can be used by customers to develop their own custom applications or to integrate with their own or other third-party systems. Bridging the gap between the virtual world and real worlds. Web-based controlling or monitoring devices used to require circuit design, network architecture changes, scripting languages and website design proficiency. Even when all requirements were met, connectivity issues between local network devices and the Web could render many projects impractical. ioBridge removes all of the hurdles encountered during DIY project and commercial product Web connectivity. At ioBridge, we’re keenly aware of the novelty and utility involved in connecting real world devices to the Web. We also understand the difficulties most face when trying to accomplish this goal. After extensive study, ioBridge has developed a patent pending platform that seamlessly connects real world devices to Web users around the world. Now you can convert ideas into completed projects faster than ever before possible. You supply the idea. We supply the infrastructure. The ioBridge platform is end-to-end enabling a wide range of applications for manufactures, professionals, and casual users. ioBridge is both a hardware and cloud services provider. Just like moving your email to the cloud, ioBridge has enabled you to create the most innovate control and monitoring applications using highly-scalable web technologies. ioBridge features end-to-end security, realtime.io streaming to web and mobile apps, and easy-to-install and easy-to-use products. 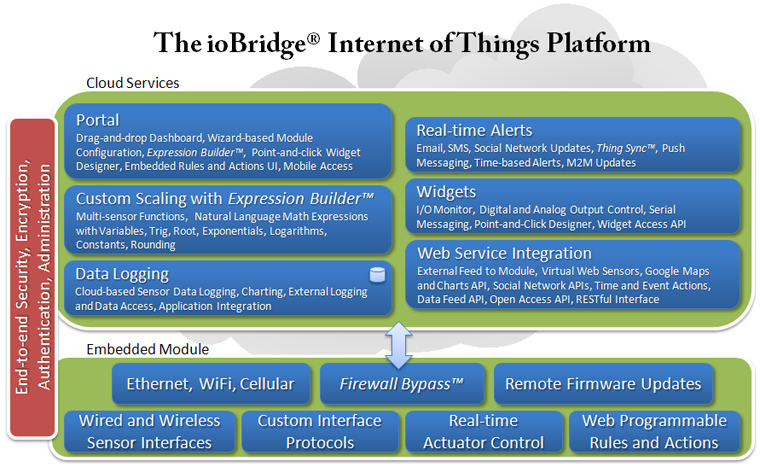 The following diagram illustrated some of the major features of ioBridge's technology. The tight integration between the embedded devices and the cloud services enable many of the features shown in the diagram that are not possible with traditional web-server technology. Note that the off-the-shelf ioBridge embedded modules also include web-programmable control or "Rules and Actions". This enable the ioBridge embedded module to control devices even when it is not connected to the ioBridge cloud server.